Following on from my morning skincare routine which you can check out here, I now present to you my evening skincare routine!. I am loving my evening skincare routine as much as my morning one, and loving how my skin looks too. 1) I have really gotten in to the whole double cleanse thing that has been floating about and if I have been wearing make-up I will firstly use the Body Shop Camomile Silky Cleansing Oil, which is bloody awesome, it removes even really stubborn eye makeup, even if I do look like a Panda when i use it! 2) I then follow with the same cleaner I use as my morning cleanse, the Soap & Glory Peaches and Clean 3-in-1 wash-off deep purifying cleanser (boy that is a mouthful!). 3) To tone my skin, I have been loving the Clarins Gentle Exfoliator Brightening Toner it was quite expensive, but I think its working! 4) Next up is Serum, and I use the same serum as I use in the morning (Nivea Cellular Anti-Age Serum). I am currently saving my points to buy the Estee Lauder Advanced Night Repair Serum although if any of you have any recommendations, I am open to suggestions. 5) If my skin is being a bit problematic spots wise, I will bring out the La Roche Posay Effaclar Duo Anti-Blemish Cream . This works absolute wonders. I have just purchased the new and improved formula and will do a comparison post soon. I love that this cream doesn’t smell strong, and has a nice thin texture so you don’t feel it on the skin. 6) To continue with the Soap & Glory lovin that’s been happening here recently, I have been using their Wish Upon a Jar Night Cream . It has the same delicious smell that my morning moisture has, that lovely peachy, fruity scent, but is thicker in consistency, but not to thick that it doesn’t soak into the skin. I have also been adding the Clarins Radience Plus Golden booster, that I use in my morning routine, just to give my face that extra something! 7) Finally, the eye cream, and yes I am just as bad as putting this on at night as I am in the morning. I use the same eye cream (the Body Shop vitamin E cream ) as the skin around my eyes can react quite badly to heavier creams, so if you have any suggestions for night-time eye creams, that aren’t too heavy (and I don’t mean thick, I mean strong!) then let me know too! 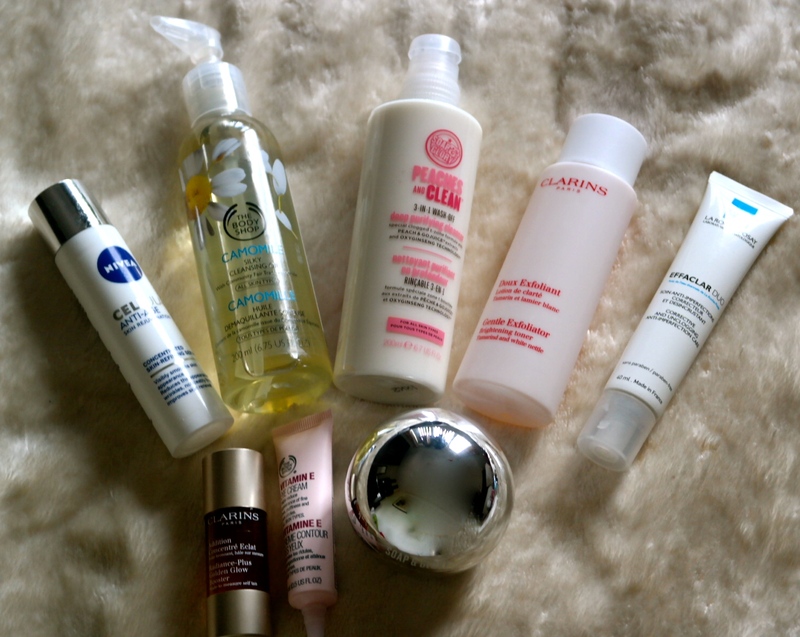 Well that’s my night-time skincare routine – what’s yours?